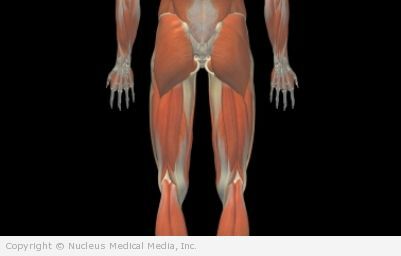 A strained gluteal muscle is a partial tear of the small fibers of the gluteal muscles. The gluteal muscles are a group of three muscles in the buttocks. This is not a common injury, but is sometimes seen in runners, dancers or other athletes. For a severe gluteal strain, you may have an MRI scan. Professional and collegiate athletes sometimes have MRI scans to predict the length of recovery. Do not do activities that cause pain, such as running, jumping, and weightlifting using the leg, hip, and buttocks muscles. If normal walking hurts, shorten your stride. Do not play sports until the pain is gone. Apply ice or a cold pack to the affected buttock for 15-20 minutes, four times a day, for several days after the injury. Wrap the ice or cold pack in a towel. Do not apply the ice directly to your skin. Ask your doctor if you have any questions about using these medications. If you still have tenderness while taking these drugs, do not return to physical activity. Check with your doctor before returning to activity. Apply heat to the affected buttock only when you are returning to physical activity. Then use it before stretching or getting ready to play sports. When the acute pain is gone, start gentle stretching and strengthening exercises as recommended by a healthcare professional. Stay within pain limits. Hold each stretch for about 10 seconds and repeat six times. Stretch several times each day. If you are diagnosed with a gluteal muscle strain, follow your doctor’s instructions. After a short warm-up period, stretch your gluteal muscles before physical activity.